An unprecedented software glitch in the signalling system of the East-West Line resulted in a stalled MRT train being hit from behind by another one at Joo Koon station yesterday morning. This resulted in injuries to 29 people, three of whom were still in hospital yesterday evening. The collision took place at 8.20am during the morning peak hour and disrupted train services between Boon Lay and Tuas Link stations through the day. Train services between Joo Koon and Tuas Link stations will remain suspended today while the authorities carry out their investigations. Bus bridging services will be provided to the affected passengers. Other trains on the East-West Line will run at slower intervals. In the accident yesterday, the first train had pulled into Joo Koon station when it stalled because of an anomaly in the signalling system, and its passengers were offloaded, save for a solitary SMRT staff member who remained on board. The second train, which had stopped more than 10m behind and was carrying more than 500 passengers, unexpectedly lurched forward and collided with the first train. At a press conference later in the day, Land Transport Authority (LTA) and SMRT officials explained that the signalling system had mistakenly profiled the stalled train as a three-car train, instead of the six-car train that it really was. As a result, the second train which had stopped 10.7m behind the first "misjudged the distance" between the two, resulting in a collision. "It is an awful day today. Commuters were inconvenienced, and some even injured. We are deeply sorry for that," said Transport Minister Khaw Boon Wan, who showed up at the press conference and spoke to reporters after it was over. SMRT chief executive Desmond Kuek was present, but did not speak. The incident was the latest in a series of mishaps that have hit the train operator, including tunnels between Braddell and Bishan stations being flooded last month. Sharing their preliminary findings yesterday, SMRT and LTA said the first train departed Ulu Pandan depot with a software protection feature, but this was "inadvertently removed" when it passed a faulty signalling circuit. Passengers got off the stalled train and the second one halted at the correct, safe stopping distance behind it. However, the second train moved forward a minute later when it could not properly detect the stalled train as having six cars. Mr Alexandru Robu, 35, who was in the second train, described how it came to a sudden halt after its impact with the first one, causing passengers to lose their balance and fall. "I have experienced sudden stops before on the MRT, but this time, it was really bad," said Mr Robu, a service coordinator. 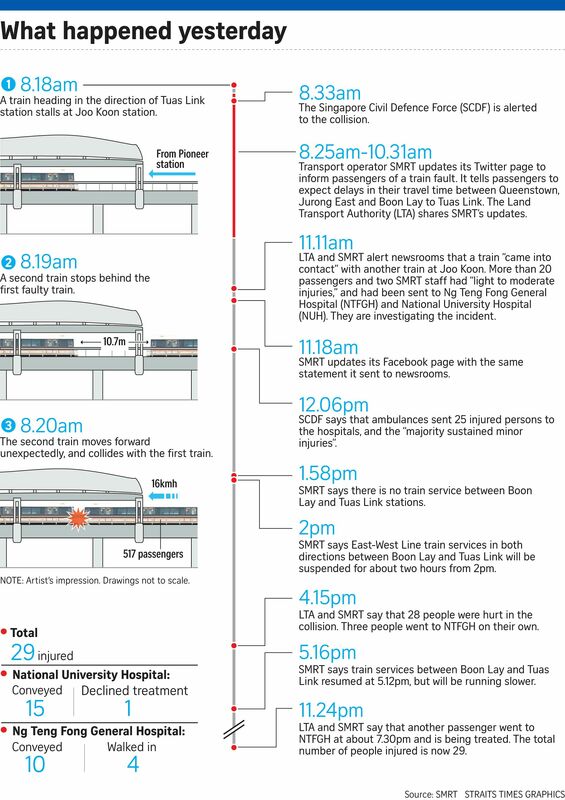 One MRT employee on each train and 27 commuters were hurt. Several were taken to hospitals, and most were discharged with minor injuries. The remaining passengers were taken off the train through the driver's cabin at the front - a process that took some time. Thales, the firm supplying the new signalling system for the North-South and East-West lines, said it had never encountered a glitch similar to yesterday's before. Mr Khaw said after the press conference: "Thales is confident of their system, but I advised the team, let's play doubly safe, where safety is involved, that is why I want them to suspend the Tuas West Extension tomorrow, so we have a whole day to do a thorough check before we resume the Tuas West Extension." Asked if a committee of inquiry will be convened to look into this, Mr Khaw said the investigation should be allowed to take its course. On whether commuters' confidence in the MRT system had been undermined following yesterday's accident and last month's MRT tunnel flooding, Mr Khaw said: "Obviously people will be upset... I am equally upset."